We are very fortunate in San Francisco to have an army of Volunteers that prepares and distributes food to our estimated 7,000 homeless population and additional under served populations. At Thanksgiving, Food Runners volunteers double their efforts to provide some of our city’s finest foods to these communities. Food Runners is among the vanguard in this holiday effort, coordinating, distributing and serving food citywide, for this year’s Thanksgiving. In an annual tradition for the past 6 years, on Thanksgiving eve, SusieCakes in the Marina donates all their surplus pies and unsold baked goods to Food Runners. Food Runners volunteers, in turn, picks up the donation and delivers it to Veteran’s Academy in the Presidio. The SusieCakes Thanksgiving Eve pick up is one of the most sought after Food Runs of the year amongst Food Runners Volunteers. 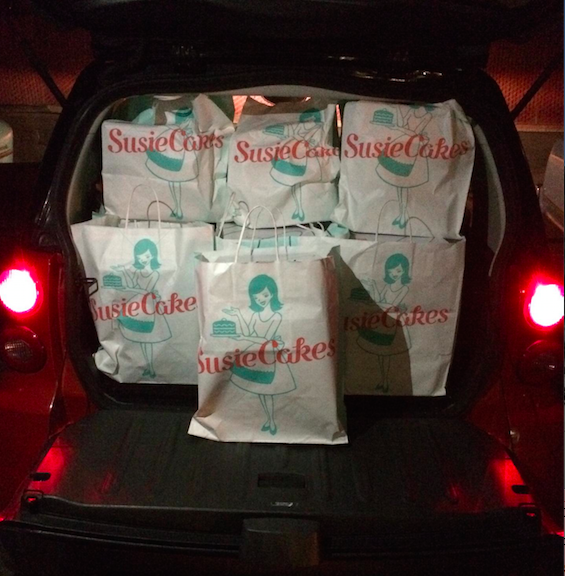 This year, SusieCakes will be also be donating a similar lot on Thanksgiving Eve from their newly opened shop in the SalesForce Tower. Also on Thanksgiving eve, Food Runners delivers donated baked goods from Noe Valley Bakery to Martin DePorres. This is an annual tradition that's been going on for more than 15 years. I know that collecting food for Food Runners has been one of the most fulfilling experiences of my life. Seeing the gratitude on the faces of folks receiving the food is the reward that makes me want to do even more. Glide Memorial Church in the Tenderloin serves 1100 for brunch and 2400 for dinner on Thanksgiving Day. St. Anthony's Dining Room in the Tenderloin serves a traditional Thanksgiving meal to 4,000 on Thanksgiving day. St Vincent DePaul Multi Purpose Center in SOMA serves 1,000 meals on Thanksgiving Day. Fraternite Notre Dame in the heart of the Tenderloin serves a traditional Thanksgiving meal on Tuesday in Civic Center Plaza and another full Thanksgiving meal the Wednesday before Thanksgiving at their dining room in the Tenderloin, 700-800 total. 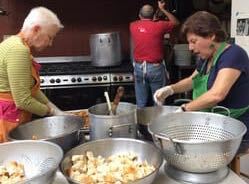 Martin DePorres in the Mission serves 300 people on Thanksgiving Day. City Team in the 6th Street Corridor serves a traditional meal the day before Thanksgiving. They serve 450 meals at three seatings, Noon, 1PM and 2PM. Mother Brown's Dining Room in Bayview serves 500 meals on Thanksgiving Day. 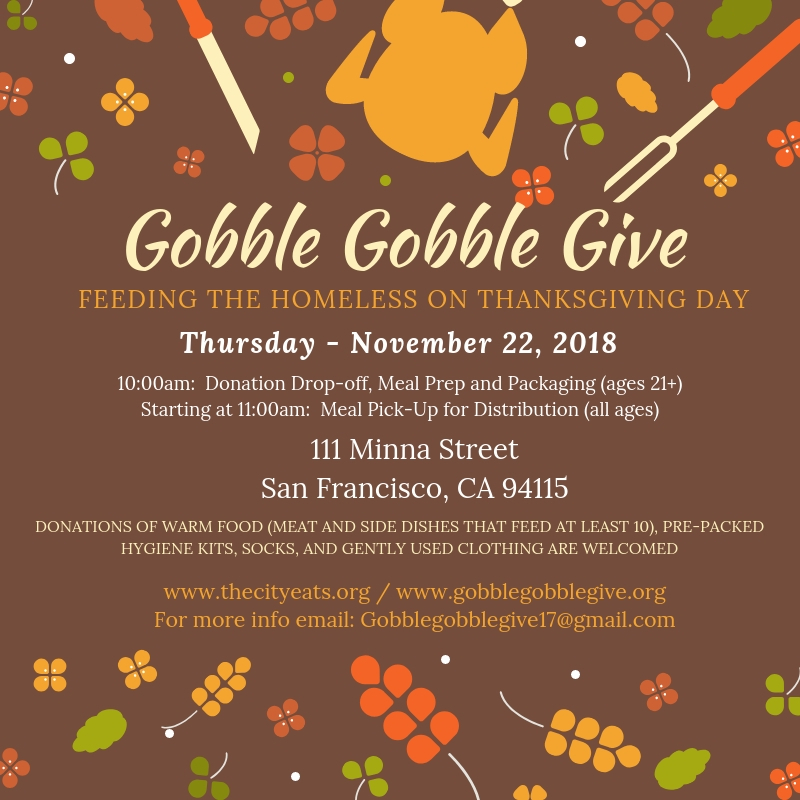 City Impact in the Tenderloin serves Thanksgiving Day. 4,000-5,000 meals. The Lima Center at St. Dominic's Church at serves a full, traditional Thanksgiving Dinner to approximately 75 homeless clients on the Wednesday before Thanksgiving. The City Eats volunteers prepare, assemble and package individual Thanksgiving meals for distribution to those living on the streets. City Eats provides individual hygiene kits along with the meals. As you can see, a tray of rice and five burritos is not a good fit for a large soup kitchen like Glide, just as 23 cases of broccoli would not be a good fit for A Woman's Place where there are only 30-40 clients and no cooking facilities. 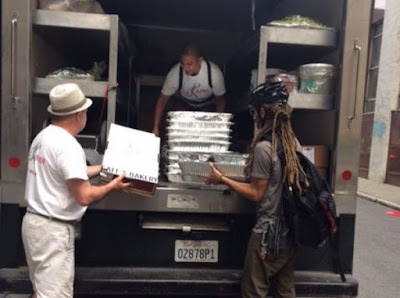 In addition to matching the donations and the recipient organizations by type of food and number of people served, Food Runners also takes into account the proximity the donor and the recipient, as well as the hours within which a recipient can receive donations. With over 600 pick ups per week, the sheer logistics of it all get complicated. So... how does Food Runners make sure the food gets to where it is needed most and can best be used? By using the new Food Runners app. 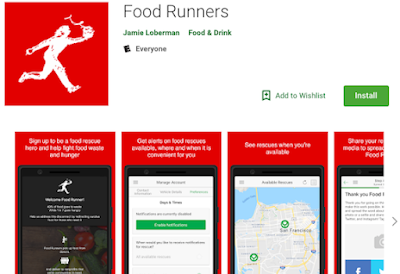 The new app uses algorithms to best match donors and recipients according to Food Runners guidelines. No more time spent scrolling through databases and lists to put it all together. The app figures out the best recipient for delivery within seconds of when a Donor enters their pick up request, and with greater accuracy too. In addition, the app provides speed and convenience for Food Runnners Volunteers. No more waiting for relayed information from the dispatcher. Volunteers desiring to do a food run at anytime need only open their Food Runners app and self select from the available runs displayed. All the information needed to perform a run, including the best route, is provided. 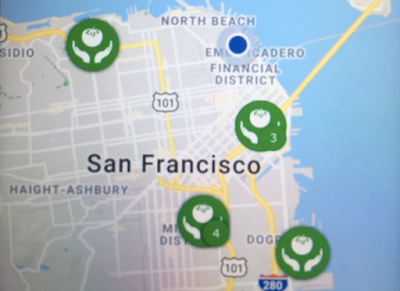 Overall, the app provides an avenue for Food Runners to get more food to more San Franciscans in need. Food Runners: mission accomplished.